And just like that, another year has come and gone! To say I had BIG GOALS this year would be an understatement. While I put the "BQ" dream on hold, I went after a different, some might say "bigger" goal of attempting my first 100 Miler. Unfortunately it didn't go as planned and I ended up with my first DNF ("did not finish"). But that's the thing about big dreams, you have to be prepared to fail! So, no, I didn't get that 100 Miler finish this year, but I did run multiple 50 milers and my first 100K this year, getting more comfortable with Ultra Distances in the process. In addition to all that above, I also kept up with my ridiculous amount of running and racing. Outlined briefly by month below. January is actually my least exciting month. I didn't do any races, and I didn't really go anywhere. I mostly just spent the month training for my spring marathon. One notable thing, is that I did unleash the monster that is Loki! My sweet, shy, scared black lab mix we adopted in November 2015...turned out to be a RUNNING MACHINE! He had a blast getting introduced to trail running off leash and I don't think he will ever look back! February was another slower month in terms of racing, although I did head to Denver to run the Snowman Stampede 10 Miler as my first race on the Runners Roost Race Team! I also went to Southern California for a work trip and got to meet up with an online running friend for a run at Newport Beach and go to Disneyland! I once again ran Canyonlands Half Marathon this year - easily one of my favorites (and Moab in March has become an annual thing for me that I hope to continue!). The highlight of this particular trip to Moab, was getting up super early and hiking to Delicate Arch to see the sunrise! The very next weekend after this trip, I ended up joining a friend in Monument Valley where we volunteered at the Monument Valley Ultra's. After a day of volunteering, we ended up camping to the most beautiful views! It was pretty incredible to say the least! In April, I ran the Salt Lake City Half Marathon (originally planned to do the full, but felt like I needed more training under my belt, so dropped to the half). Scott and the pups came with me and we had a great time exploring a new place! I really liked this race a lot, and found I liked Salt Lake City a lot as well. We hiked to a pretty cool Hot Springs on the way back home as well! May is ALWAYS one of those crazy busy months and this year was no different. I started the month off running the Colorado Marathon. It was my goal Marathon for the year, and of course, it didn't go as planned (so many of my races don't these days!). I didn't end up with a PR like I had hoped, but it did end up being a BEAUTIFUL race with fresh snow falling in Poudre Canyon! I also ran the Black Canyon Ascent again (another favorite), and at the very end of the month headed up to Jackson, Wyoming to start my first ever solo car-camping adventure as I explored Grand Teton and Yellowstone National Parks! My car-camping adventure covered the very end of May and first part of June, and ended with a meet-up with my mom and brother in Jackson to run the Grand Teton Half Marathon on June 4th! The very next weekend after the Grand Teton Half, I hopped in the car again and made my way to Denver for the Skirt Sports Ambassador Retreat Weekend and 13er Race. I had a blast getting even more involved in the Skirt Sports community and meeting so many awesome women who I've known from Social Media! July was my BIG month getting ready for my 100 Miler attempt. I ran my highest mileage month EVER, at 263 miles (274 including hiking). 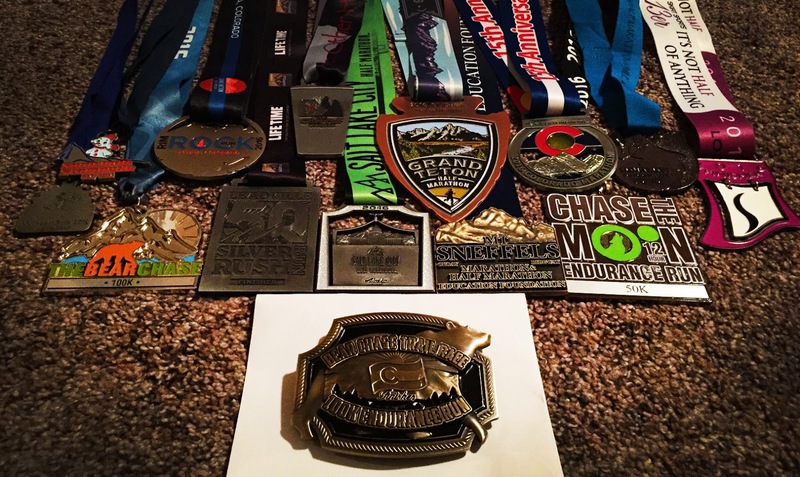 I ran the Leadville Silver Rush 50 Miler, Chase The Moon 12 Hour Night Run (covering 31 miles in about 8 hours in the dark) and the Grand Mesa 50 Miler! 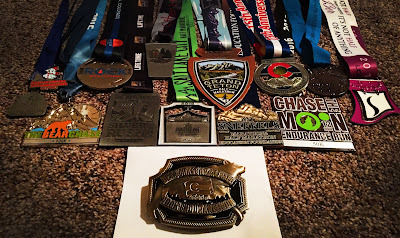 These were all HARD, challenging trail races, but so awesome and rewarding and they definitely got me more comfortable with true ultra running, and feeling a little more prepared for August's big adventure! In early August I ran Mt. Sneffels Full Marathon for the first time (after running the Half several times before), and then it was time to taper for the big one! At the end of August, Scott and I loaded up the car and made our way to the Black Hills of South Dakota for my attempt at the Lean Horse 100. I ran really well for the first 40 miles until I ended up with fueling issues (couldn't keep food down) and had to call it quits at 56.6 Miles. Of course, I was super bummed, but it is what it is. The course was absolutely beautiful though and I'm so glad I got to see that area of South Dakota, including Mt. Rushmore! Mileage-wise, September was pretty lacking compared to other months, BUT, that definitely made it no less epic! Right after our trip to South Dakota, Scott and I headed up to Alaska for a week to visit Scott's family. This was just what I needed after my sad DNF at Lean Horse. We had lots of fun taking the train for the first time, as well as ice climbing, Kayaking, and hiking! We visited Alyeska/Girdwood and Seward, and I saw the Northern Lights for the first time! In the middle of September, I also hiked my one 14er for the year, Mt. Massive, with my friend Kellee - putting me at eleven total 14ers down (and I have officially hiked at least one 14er every year since I started hiking in 2011!). At the end of the month, I also decided on a last minute attempt at a 100K comeback race (not quite as good as 100 miles, but better than nothing), finishing The Bear Chase 100K as the second place female in a time of 14:33:07, and getting a HUGE PR in the 50 Mile Distance by over an hour! I was a pretty happy camper about ending my ultra season on this note! The second week in October marked another great solo adventure for me - heading to Kanab, Utah for The Grand Circle Trailfest. This was three days of running and exploring around Bryce Canyon, Zion, and The Grand Canyon (North Rim). I had never been to any of these parks (except Grand Canyon South Rim as a kid), and had a blast checking out this area! My only disappointment was not having enough time to see more! I will definitely be heading back this way in the future to explore more! I also ran The Other Half, a Half Marathon in Moab, and had a lot of fun staying with local friends in Moab for the weekend! My highlight in November was running the new Rim Rock Downhill Half Marathon - which was a BLAST. I crushed the downhill running my second fastest Half Marathon in a time of 1:41:44. I also ran the local Grand Junction Turkey Trot (Turkey Trots are now an annual requirement) in 23:42. It was nice to see my speed coming back after all the slower-paced trail and ultra running I'd been doing over the summer and early fall! My long distance racing always comes to end by December, and this year was no different. I once again ran the Winter Sun 10K - in my second fastest 10K time of 47:46, and also ran a new local race - the Santa 5K. Slick conditions kept it a bit slow for me, but I still managed 3rd Female overall in 25:10. This month was also spent really ramping my mileage and training up for The Houston Marathon which I will be running on January 15th, 2017! Overall it was a pretty great year. I once again achieved a new mileage year PR - covering 2310 miles on foot, 2175 of those specifically running (as of 12/26). I had some awesome adventures and got to see some amazing new places, and dove into the Ultra Running world even more! I'll be heading down to Houston to run the Houston Marathon on January 15th and after that, I'm free! I've been planning races and runs non-stop since I started running, so I'm looking forward to taking a little bit of a break after Houston. As of now, I honestly don't know how long of a break I will take. I'm sure I will continue running and maybe doing some races here-and-there, but really who knows! This latest marathon training cycle has been exhausting and I haven't been super motivated, so I'm looking forward to not having any running commitments for awhile. That being said, I'm a huge planner though, so I'm sure I will eventually have some definitive plans again! While I loved being a part of the Runners Roost Race Team this year, I found it was just a little too difficult to keep up with my team duties from this side of the state...so I decided not to apply for 2017. I still love Runners Roost though and will definitely still continue to advocate for and support them when I am in the Denver area (and I'll keep holding out hope that we'll get a store here someday!). I am, however, hoping to keep my Skirt Sports Ambassadorship and my membership on Team Beef, so long as I get accepted again (2017 hasn't been announced yet for these two). As I'm sure you're aware, I'm pretty much ALWAYS wearing Skirt Sports - not only do I love their clothing, but also the awesome community of active women that the company supports! I also applied for a few new ambassadorships - Boco Gear and Balega Socks - so fingers crossed I get onto those teams! Boco Gear is based out of Boulder and makes all of the awesome accessories for Skirt Sports! Balega makes the primary running socks I've been wearing since I starting running 4 1/2 years ago, and I LOVE them! Even though I follow you on strava, had no idea you ran so much! Great year for you, enjoyed being your teammate for a year. Keep it up with all the beautiful pictures!